Images credit & copyright: NASA. Most enter the last week of January as any other. Days begin to grow longer as the chill of winter brings its worst while thoughts of spring begin to thaw in our minds so long as we can dodge a few more winter storms before then. There are many of us however, that view this week in an entirely different light. This is a time that we embark upon a period of remembrance of NASA’s darkest week and terrible loss. A week that, over the course of a couple generations saw 17 Astronauts meet their ends. I will, in the next few days do my best to help us all remember them, how much they meant to the industry, and how much they meant to those of us who remember them every day even though we had never met them. 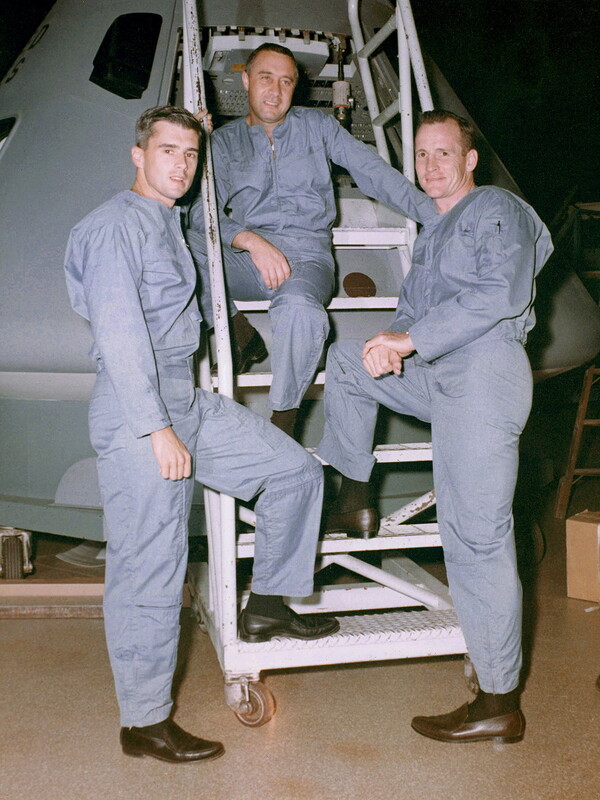 Virgil “Gus” Grissom: Born April 3, 1926: Father/Husband/USAF Lieutenant Colonel/Test Pilot/Astronaut Group 1 “Mercury Seven”/Mercury Redstone 4/Gemini 3/Apollo 1. Edward H. White: Born November 14, 1930: Father/Husband/USAF Lieutenant Colonel/Test Pilot/Astronaut Group 2/1st American spacewalk/Gemini 4/Apollo 1. Roger B. Chaffee: Born February 15, 1935: Father/Husband/U.S. Navy, Lieutenant Commander/Naval Aviator/Apollo 1. “If we die, we want people to accept it. We are in a risky business and we hope that if anything happens to us it will not delay the program. 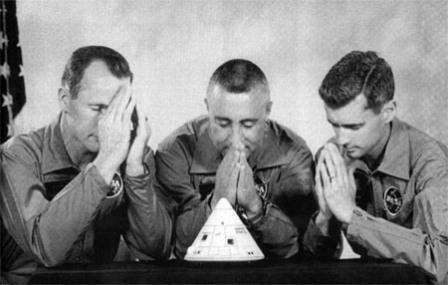 The conquest of space is worth the risk of life.” – Virgil “GUS” Grissom after the Gemini 3 mission in 1965. 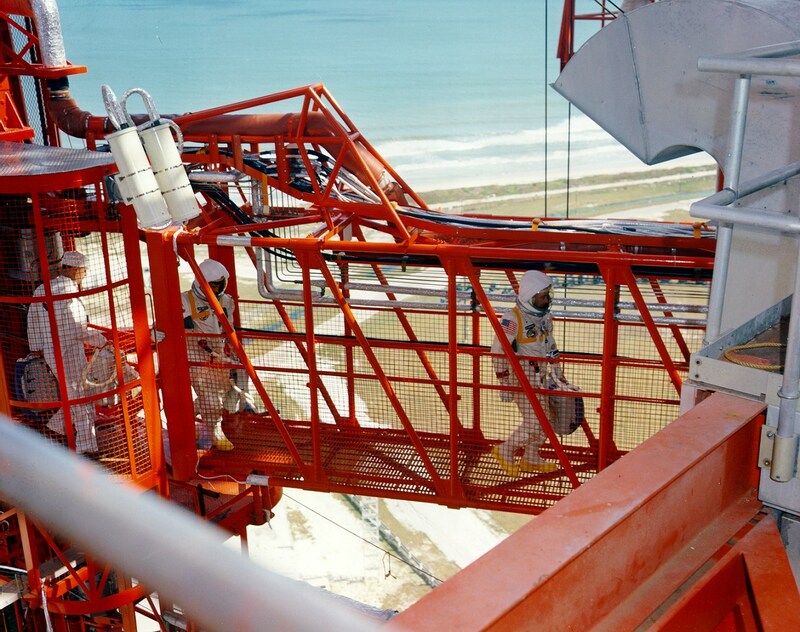 Crew of Apollo 1 crosses the gantry at LC-34 prior to spacecraft entry on January 27, 1967. 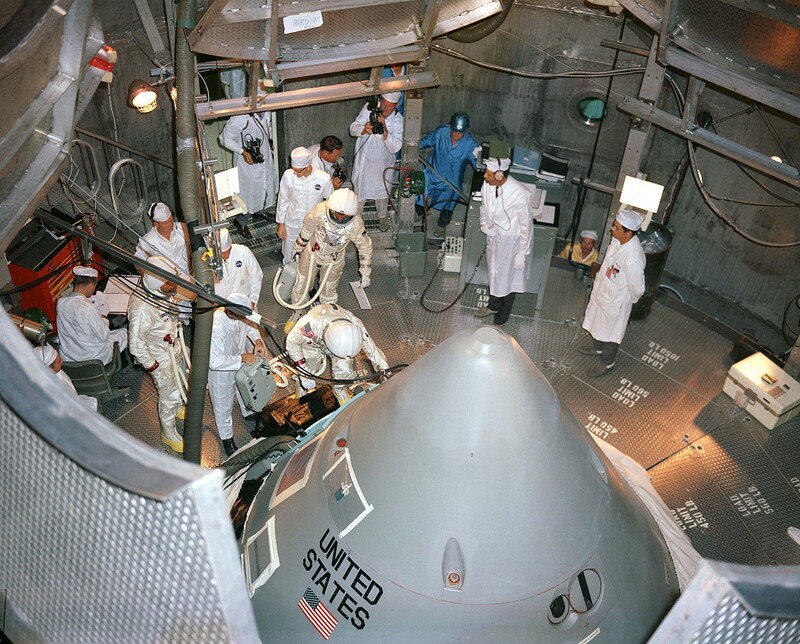 Apollo 1 crew in the altitude chamber as they enter CM-012 (AS-204) during training on October 18, 1966. April 1, 1966: After standard crew images the Apollo 1 crew creates this image to present to Apollo Project Manager, Joseph Shea. CM-012 was delivered to Kennedy Space Center on August 26, 1966 under a conditional flight worthiness certificate. However even after delivery, six hundred and twenty three engineering change orders had to be made as well as one hundred-thirteen incomplete engineering changes. This wasn’t the first time that the patience of the crew had been tested. Prior to this day Grissom had become so frustrated with the number of changes as well as the lack of ability of the simulator to keep up with those changes, he had actually brought a lemon from a tree at his home and hung it on the simulator to say the craft was a lemon. At 23:30:54 UTC (18:30:54 EST) during the plugs out test electrical power momentarily failed which likely caused arcing to the interior equipment. The crew first noticed the fire approximately ten seconds later as Chaffee was heard yelling “Hey!” Two seconds later White yelled “Hey, we’ve got a fire in the cockpit!” a few more panicked yet brief transmissions were heard along with the sound of the hull of the spacecraft itself rupturing from the pressure. 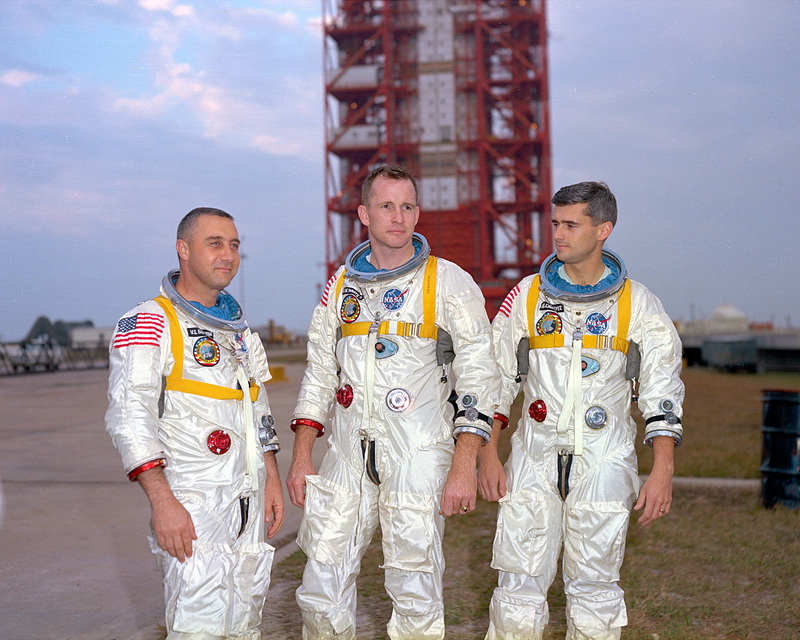 All transmissions ended only 17 seconds after the first report of fire……The crew of Apollo 1 had been lost. The fire, as it would be determined, had 3 main causes. 3: Large amounts of flammable material in the cabin. 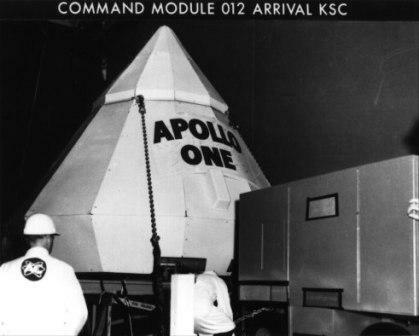 Buzz Aldrin later stated that after the meeting with Shea, he gave the order to have the flammables removed but didn’t oversee the order personally and due to that lack of oversight, they were later placed back in before packaging and shipping to Cape Canaveral. On April 24, 1967 at the request of the widows, Mission AS-204 was officially changed to Apollo-1 as the three astronauts themselves called the mission. “You sort of have to put that out of your mind. There’s always a possibility that you can have a catastrophic failure, of course; this can happen on any flight; it can happen on the last one as well as the first one. So, you just plan as best you can to take care of all the eventualities, and you get a well-trained crew and you go fly.” – Virgil “GUS” Grissom. Image | This entry was posted in Images, People, Video and tagged Ad Astra Per Aspera, Apollo 1, Apollo One, Cape Canaveral, Ed White, Gus Grissom, Kennedy Space Center, NASA, Per Aspera Ad Astra, Roger Chaffee, Saturn 1B. Bookmark the permalink.